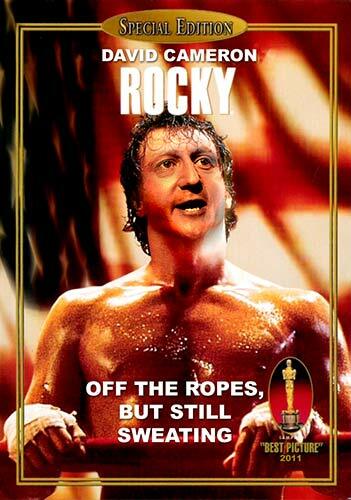 “Rocky” Cameron rolls with the punches | Curly's Corner Shop, the blog! PM emerges bruised from the debate but not battered. Haven’t done a “pea roast” for a while so I thought I’d throw a couple in today. Apologies for the lack of posts recently, I’ve been doing a gargantuan research into the analytics of this blog which has now been running for six and a half years, a lot has changed over that time in terms of readership and demographics along with a huge increase in the amount of blogging, micro blogging, social networking, and the platforms which carry such content. Suffice to say that this blog either needs to keep up with the pace of change or close completely in advance of a new offering. There certainly will be changes over the coming months, the first of which will be a total overhaul of the sidebar links, many of which are now dead, followed by a complete alteration to the style sheet and template. Sorry it has taken so much of my time but it has been a necessary journey. I managed to catch the first hour and a half of yesterdays debate in the House of Commons and the Prime Minister’s statement about the phone hacking affair, a debate in which he was seen to come out fighting and defended himself reasonably well against MPs lined up to beat him into submission. This was no “humble pie” moment, but a tough fight, Cameron had his back against the ropes and had to take on all comers, he was expecting a heavyweight onslaught from Ed Miliband but the Opposition Leader appeared to have lost some weight, or focus, and only managed to pepper “Call me Dave” with middleweight shots to the midriff, however it was enough to strengthen the nerve of his corner who sent in wave after wave of bruisers to rough up the PM. Cameron didn’t hide away, he stood in the ring for what seemed like 38 rounds and after the fight was roundly applauded by his supporters, including what looked like a 13 year old schoolboy journalist Daniel Knowles. So a success for David Cameron, but Ed Miliband is not too unhappy either. The Parliamentary Labour Party seems satisfied enough with the few hits he has landed over the past fortnight. In fact, I just spotted him in Strangers’ Bar with (I think) David Miliband with a broad grin on his face. So both leaders are going into recess as secure as they could reasonably hope to be. Everyone’s a winner – everyone but Rupert Murdoch anyway. The South Shields MP David Miliband must have been pleased, nobody mentioned his partying with the Murdochs! The party, held two weekends ago, reveals the extent of the couple’s connections on both sides of the Commons. As a jazz band played in the landscaped gardens of the £6 million property, Mr Freud, who was wearing leather trousers, greeted guests, including Education Secretary Michael Gove and Culture Minister Ed Vaizey. They drank champagne in the company of former Labour Cabinet Ministers Peter Mandelson, David Miliband, James Purnell and Douglas Alexander. He’d also be pleased in knowing that news of his other work for US corporations was well and truly buried by yesterday’s cream pie bun fight as he continues treading the path created by his mentor Tony Blair. However it was good to be reminded by the PM that the vast majority of the phone hacking outrages happened some years ago whilst Blair, Brown, and Miliband were running the ship on to the rocks, as we recalled Rebekah Brooks statement the previous day that she’d been invited to Downing Street about six times a year by the last Prime Minister but so far not once by Cameron. The PM also got in a great right hook at Ed Miliband by reminding him that since Coulson is no longer in government employ, the only person with an ex News International hack working for them is the Leader of the Opposition! As a “judgement day” fight it lived up to it’s billing, the referee had a great deal of work to do much of it in keeping the baying hoards quiet, some just wished that Bercow could manage to be a little more even handed and hush the Labour benches too. Miliband the middleweight could be judged to be both effective and dangerous in the opening rounds but he soon ran out of steam, the fact that he still has a former News International employee working in his corner will not have helped, but fortunately his troops ensured that Cameron took a number of body blows particularly about those conversations hinged around the BSkyB takeover, he kept ducking and diving to evade the shots whether they were “inappropriate” or not! One wonders why his corner men did not give him a better briefing on Labour’s tactic for this manoeuvre, surely it would have been far better for him to tell the ringside spectators that yes it was inevitable that people came to him and discussed the proposed deal, that’s just what we expect major companies to do with Prime Ministers, but actually I listened and fobbed them off, I told them I have no say in the matter, go and see Jeremy Hunt instead! Instead he stood there trying to parry the blows to the ribs round after round after round until with the final shot he just let out an anguished sigh! It was an unedifying end to a long fight. Many will judge this fight as a draw and look forward to a rematch after the summer recess, Cameron’s judgement is still under question today and he needs to reveal the name of the company employed to vet Coulson on behalf of the Conservative Party when in Opposition, Miliband needs to get on with publishing the long list of contacts between himself and executives on News Corporation and News International, he also needs to consider if he should continue employing former Times man Tom Baldwin. Cameron scored his best shots by reminding the House that the priority now is to clean up the mess and revarnish the reputation of British journalism (for surely the phone hacking scandal can not be exclusive to News International), and to weed out those corrupt police officers who have been allegedly prepared to take bribes in return for information. He was adamant that the police investigation and the judicial enquiry must be allowed to go wherever the evidence leads them. Miliband may think his summer holiday will be a cool breeze but he needs to ensure that Labour’s time in The Sun doesn’t leave him with nasty burn marks, whilst Prime Minister Cameron will head off to the coast still in a sweat, but with a dark cloud continuing to hang over him. Perhaps he should be SLAPP’D.Must admit that I am bemused by tonight’s “Gazette frontpage story, my limited understanding of SLAPP’s was that the Goliaths used them to intimidate the Davids, rather than the other way round, am I missing something? We are all missing a lot, think I will turn my attention to it tomorrow. Apologies, I am, it is an anti SLAPP that has been filed, so the metaphorical David is counter punching and tackling “Goliath”. The council tax payers of ST will be even more hacked off by these legal machinations in the Sunshine State, and goodness knows what an expensive pickle will result, if this litigation can be and is appealed all the way to the US Supreme Court; John Grisham territory this.